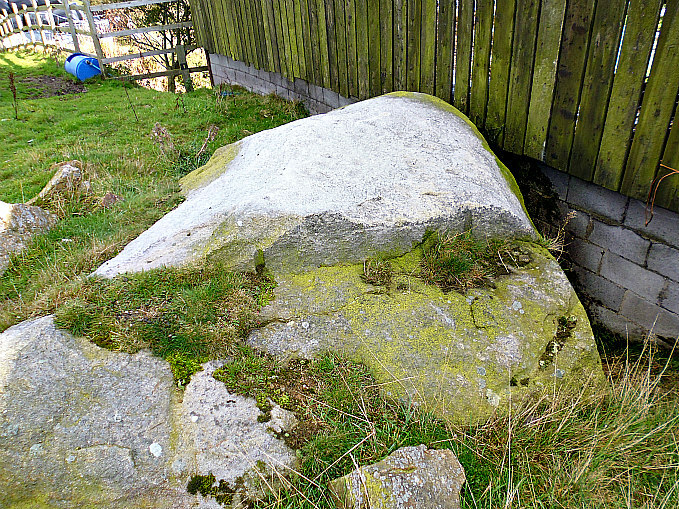 Greystones Farm Cup-Marked Rock (beside the large barn). OS Grid Reference: SE 00621 40844. 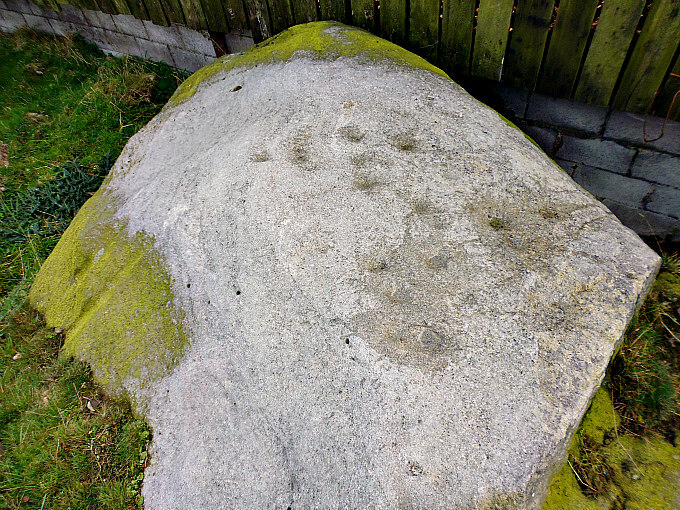 Located beside the large barn of Greystones Farm, on Greystones Lane, is a gritstone rock which has several prehistoric cup-marks. A few other rocks is the same field also appear to have faint cup-marks, and one of these large rocks, locally called Cob Stone, also has “possible” cup-marks. Just above the farm there is an outcrop of gritstone rocks called Greystones Hill. The farm is a ¼ of a mile north of Far Slippery Ford, and the hamlet of Newsholme Dean is about 1 mile to the east on Todley Hall Road. To reach the site travel down Long Gate, then onto Coppy Lane and then Greystones Lane. Walk down the rough farm-track towards Greystones Farm, making sure the wooden gate is secured behind you. Via off the track to the large barn on the left – the cup-marked stone is beside this barn. You can also reach it via the footpath from Long Gate at Far Slippery Ford. 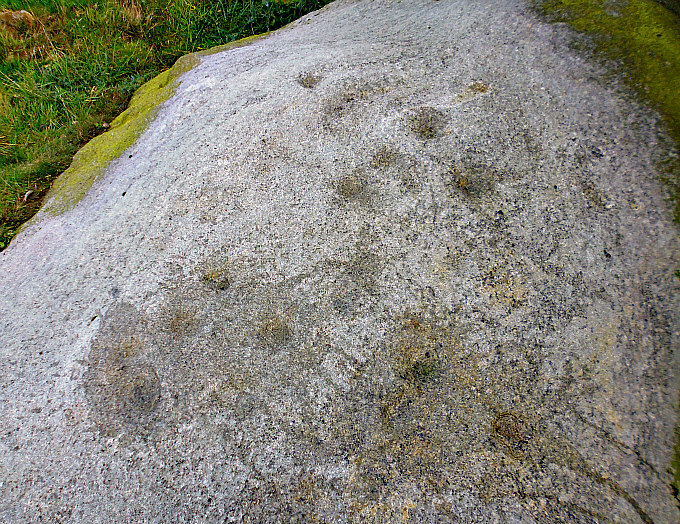 Located at the north side of Greystones Farm barn is a large, weathered gritstone rock bearing several well-defined ancient cup-marks: as many as 15 tiny cups on the flat face of this soft rock. What these carvings represent we don’t really know: maybe they represent a sort of map of the stars, or they are just ancient graffiti or doodlings, or they are a map showing ancient springs, caves, or trackways. Or do they perhaps represent something else. The whiteness, or greyness, of the rock is caused by weather related exposure over thousands of years – the exposed parts of the rock have been washed by rain to the colour that we see today, and so we have “greystones” which is sometimes spelt as “graystones”. A few of the larger rocks up the slope of the same field appear to also have cup-marks, although now very faint. One stone in particular called Cob Stone, near the top of the field at the other side of the track (SE 00553 40888) has eroded cup-marks on top. These cup-marked rocks were recorded and numbered by Boughey & Vickerman in their survey of 2003. (See The Northern Antiquarian link below). © Ray Spencer The Journal Of Antiquities. Categories: Cup-Marked Rocks, Glacial Erratics | Tags: Greystones Farm Cup-Marked Rocks near Newsholme Dean in West Yorkshire | Permalink.